Silly Wizard recorded eight albums and and continued to record and tour until the late 1980s, when the band decided to dissolve after performing for seventeen years. 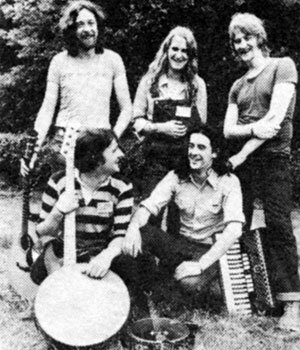 Phil Cunningham "is still composing, still producing records, still touring extensively with Aly Bain, still baffling his pals with his conjuring tricks, still being the irrepressible Phil." Gordon Jones and Bob Thomas run Harbourtown Records. Martin Hadden runs Birnam CD. Sadly, Johnny Cunningham died on December 15, 2003 in New York. Source: Gordon Jones and Bob Thomas' band history. Silly Wizard has for some time now enjoyed the reputation of being Scotland's finest traditional band — but they are much more than that! Not at all a "revival" band, they are an extremely talented group of young men who are playing contemporary music that is firmly based in tradition — most of their material is of ancient Scottish origin, and some is newly composed, but all maintains the power and expressiveness of the finest traditional stylings. With fiddle, guitar, mandola, banjo, bass, and especially the brilliant accordion playing of Phil Cunningham, they breeze through their instrumentals with amazing vitality and excitement. And Andy Stewart's beautiful vocals are backed with the most sensitive and accomplished arrangements to he heard anywhere.